There are themes in literature that tend to become a trend, but after an initial impact they start to be used in excess and follow a rather stereotypical path. 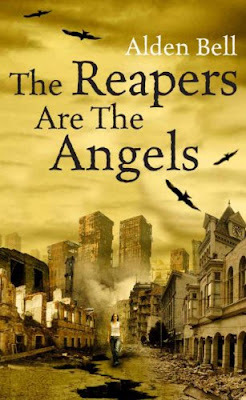 Zombies are such a trend and lately I feel that I had quite enough of this theme, but when Alden Bell’s debut novel, “The Reapers are the Angels”, came into my attention I was intrigued by the synopsis of the book. Before I knew it I went from the synopsis to the first pages of the novel and from there I set myself comfortably because I was sucked into the story almost instantly. “The Reapers are the Angels” is set sometimes into the future, a couple of decades after an apocalyptic event that turned the world into a barren place roamed by zombies. The respective event remains a mystery, but as the Alden Bell’s novel will show it has no relevance whatsoever, especially since the young Temple, the main character, is born in this world and has any notion of the world that existed before the catastrophe that ended it. The fact that Alden Bell doesn’t focus his story on the zombie populated world and that Temple knows only this world in which she was born works perfectly for “The Reapers are the Angels”. And because Temple is a child of this new world she is perfectly adapted for surviving in it, the zombies only a constant but not much of an inconvenience for the young woman. This aspect of the novel is accentuated by the encounters that Temple has with people that survived the change suffered by the world, they remember and regret the past society and the things they enjoyed the most in it while Temple finds beauty in this bleak and deserted world. More so, although Temple is fifteen years old nothing in her demeanor will betray that she is a teenager. The setting hardly permitted her to enjoy the innocence of childhood and the interests of teenagers are limited by the perspectives she faces. Her personal history contributes fully on Temple’s early maturation, events from her past turning her into a haunted but very complex character. The reader will encounter recollections of two very important events in Temple’s development almost constantly, but both of them are revealed late within the story by Alden Bell, giving them power from their mystery and delivering the small pieces of information needed to keep the reader interested in them. The presence of the supporting cast is scarce, the majority of them throwing a new light on the main character and giving her new dimensions in which to develop. Emerging from the minor characters are Maury, a man who Temple helps and through whom she sees a way to find personal peace and redemption, and Moses Todd, the antagonist who will prove to have many similitudes with Temple. These characters make a journey through the devastated world, but more than that a journey through the humanity. Because “The Reapers are the Angels” is a story about humanity, the way that humans do not necessarily change because of an apocalyptic event, they continue to represent the greatest danger and predator, but as Temple does they will continue to find beauty and a reason for surviving in any circumstances. The synopsis worked caught me, but it can be deceiving too. “The Reapers are the Angels” doesn’t have much of a plot or action, not that I was in particular search for them. It is a journey, a story of a remarkable character battling personal demons and seeking restitution. It is the story of changes in the world, with every human aspect taken into account. The novel is a study of character on a powerful setting, matched by a wonderful and flowing prose that takes the reader into a pleasant reading. Lately, I run away from zombie fiction, but “The Reapers are the Angels” didn’t prove to be a reason to keep running away. The zombie element is hardly the central part, just another cause for the world turning into a bleak setting. Instead, Alden Bell’s “The Reapers are the Angels” is a story of life, tragic in places, but engaging and beautifully written. It is a confirmation of the beauty of literature. I totally agree with the scarcity of the supporting cast and the focus on Temple's journey as opposed to the world around her. An excellent novel. The Angels are the Angels? The Reapers are the Reapers? The Angels Reap the Angels? The Angels Reap the Reapers? The Reapers Angel the Reapers? The Reapers Angel the Angels? 'Cause it seems it shouldn't be too hard to at least pick one name and stick to it. If you're too rushed to even get the name of the book straight how do we trust the review? I know it sounds dicky, but apart from that I think it's valid. And I would say it's NOT an excellent review. Take the time. Just seems rushed when something like the name of the book is named three different ways. Ryan, I apologize for my slip. Thank you for drawing my attention to them.